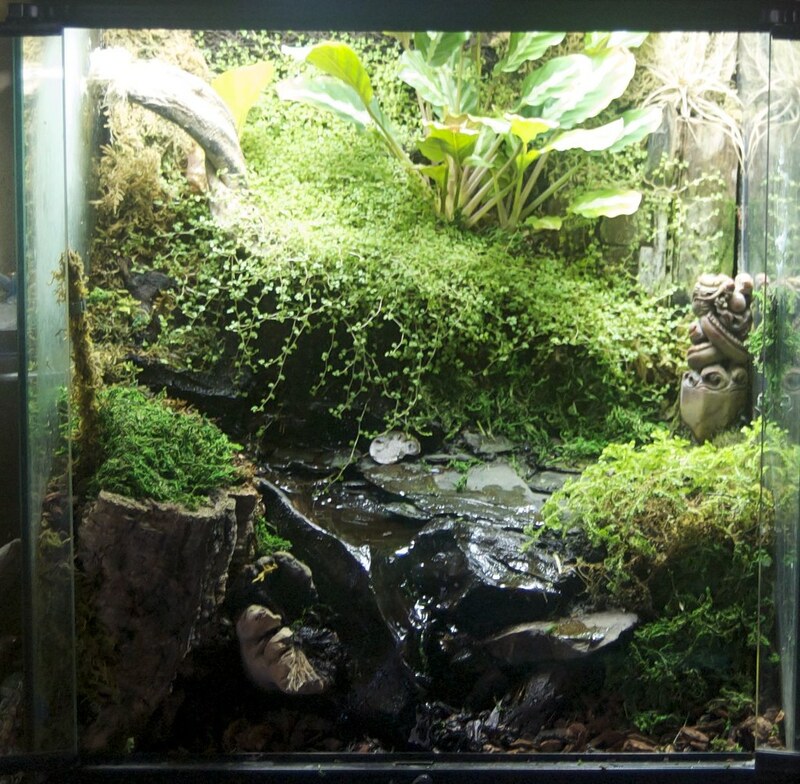 Hello all, I'm just getting out of dart frogs and thought that this would be a good place to post my well established terrarium for sale! This is a one of kind planted terrarium (not a converted aquarium) that has front opening doors, live plants, and a driftwood waterfall! I made this myself a few years back and it has been growing beautifully. You get everything, the lights, the pump, the tank, the top (the only part of the pic that I will be keeping is the stone dragon sculpture seen in the corner). This is a perfect place for frogs (including dart frogs). It is 18x18x24. It weighs a ton, but I will drain all the water out of the bottom (there is a well of water under the structure that keeps the waterfall working to fill the well you just add water through the wood substrate at the bottom) and we will slid it onto a large piece of wood to move it (a larger car at least a four door would be best for moving this thing). There is room for more plants in here! This is known as a false-bottom terrarium because there is actually a plastic structure under it that gives it those levels without having to fill the whole thing with dirt (so it's hollow!). A dart frog lived in here for five years, then I gave him to a friend with a much larger tank. Everything I used is amphibian safe, but there are no frogs in it right now. Not good for lizards or snakes cause it is too wet for them. Would be good for a tropical breed of large spider. Easy to clean and grow! Cost me 300+ to make! Will also trade for a perfect condition Fluval Edge Aquarium in Black.